Obviously the “Hysteria” album is strongly represented here with 5 songs making it onto this release, but since that’s the album that saw them become mega-stars and spawned 7 singles, the hard part was probably deciding which “Hysteria” songs to omit from a “best of” release. The follow up album, “Adrenalize” also is well represented here with four songs included. That’s nine songs from those two albums alone – enough top quality songs that most bands would be satisfied, but Def Leppard have had a long career and have included songs from most of their albums, right up to the self titled 2015 release. I would say this release spans their entire career but sadly nothing from debut album, “On through the night” makes it onto this compilation. The 80s was when I first started listening to Def Leppard and so the “Hysteria” album plus the earlier ones and “Adrenalize” were when I spent most time listening to them, so it’s no surprise I enjoy that part of the release the most, but listening to the later material it’s clear there are plenty of great songs on the more recent albums. Thankfully there arent any of the songs from “Yeah!” (their covers album) as I really wasn’t impressed by that one when it came out. 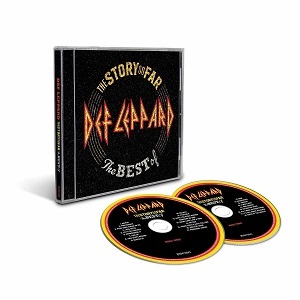 If you’re one of the many fans who stopped listening to Def Leppard after the mid-90s then this album is a good opportunity to catch up on their more recent work, and I’m sure peeople will enjoy a lot of it. Def Leppard are a band that’s spoiled for choice with their great catalogue of work, and I’m sure fans could argue endlessly about which songs should or shouldnt have been included here, but in my opinion this is a great selection of songs and something to listen to ahead of their UK tour.